304 pages | 54 B/W Illus. The genus Rhodiola (Family Crassulaceae) is indigenous to Northern Canada, Europe and Asia where its rhizomes and roots have been used for centuries for medicinal purposes. Recent interest in the species Rhodiola rosea (roseroot)in the West arose from the use of the rhizome as an adaptogen for the treatment of stress, but in the last few years, chemical and pharmacological studies have confirmed other valuable medicinal properties. The book discusses in vitro culture of R. rosea and examines pests and diseases affecting the plant in Europe, Canada, and Alaska. It also examines pharmacological bioassays and toxicology. The contributors provide a meta-analysis of clinical trials and describe experimentation with R. rosea in clinical practice. They explore its use in a range of areas, including for depression and anxiety disorders, to improve sexual and immune functions, to augment cancer treatment, and in aerospace medicine for afflictions such as mountain sickness and jet lag. The final chapter uses a model to illustrate the cultivation of R. rosea as an industrial crop from field to medicine to cabinet. Synthesizing the most important literature in recent years, the book supplies a comprehensive peer-reviewed survey of the wide spectrum of possibilities for its use as a modern phytomedicinal agent. 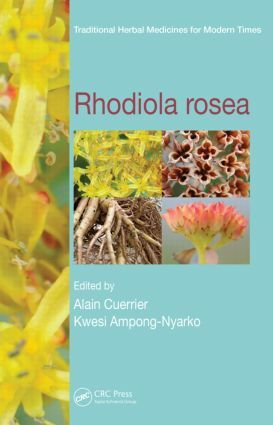 "The book is written in clear, detailed scientific language useful for those studying Rhodiola. All published research results are described and well documented. Chapters are clearly identified and well referenced. The chapters are concisely written and wherever possible provided with tables. Each ends with a comprehensive list of references. The authors have succeeded in writing a clear book covering all aspects of recent research dealing with Rhodiola rosea. The book is a good reference book for scientists, herbalists and product developers working within the food supplement industry. It could also be useful for those writing legal claims in the commercialization of Rhodiola rosea." "For professionals needing an authoritative text, clinicians, phytochemists, herb growers, pharmacognosists, and botanists, the wait is over. No matter which topics you find of interest, the well-written chapters will provide the reader with detailed and up-to-date information, impossible to find in any other single text. …an essential text for anyone wanting to use, research, or grow this remarkable plant." "This book will become the touchstone and the essential reference for anyone serious about R. rosea as a future medicine … . This volume clearly will provide researchers, health professionals, industry members, and others with a wide perspective and deep level of reliable information on this increasingly popular and beneficial medicinal plant." Dr. Kwesi Ampong-Nyarkois a research scientist at Alberta Agriculture and Rural Development in Canada. He earned his PhD in agricultural botany from the University of Reading, England. Dr. Ampong-Nyarko spent years 2004–2010 in developing the technology for growing Rhodiola rosea and made great strides in popularizing and laying the foundation for its cultivation and commercialization in Alberta. He has a multidisciplinary background with demonstrated expertise in crop production, weed science, and international agriculture development. His current research focus is on crop diversification in the field and greenhouse crops. Dr. Alain Cuerrier, researcher at the Montreal Botanical Garden and writer, earned his PhD in plant systematics (University of Montreal with one year at Harvard University) before switching to ethnobotany in 2001. He participated in the creation of the First Nations Garden in Montreal as well as in Laquenexy, France. Since then, he has started ethnobotanical and ethnoecological projects with the Inuit, Innu, Naskapi, and Cree people. He is the president of the International Society of Ethnobiology. Dr. Cuerrier has published several books on plant uses by First Nations and Inuit of Canada.